No Design Experience Necessary – Using a wizard-driven interface with drag and drop simplicity, Virtual Architect’s software makes it easy. Get Started Fast – Just import photos of your current kitchen or use the kitchen design wizard to sketch out an entirely new room. With just a few clicks, you can see what your kitchen will look like before investing in costly labor and materials! Kitchen Ideas – Need a countertop that goes with your favorite wall color? No problem! 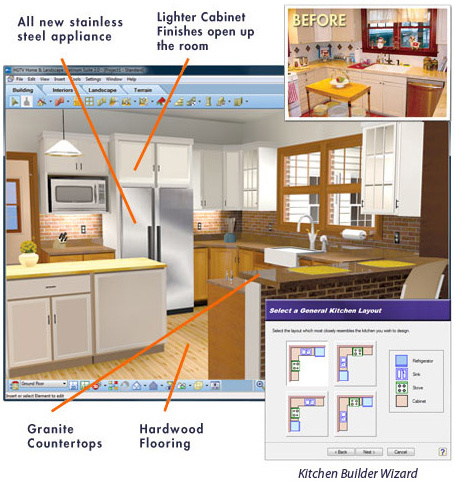 Virtual Architect comes with a complete library of paints, materials, appliances and more. You can make over your kitchen with drag and drop simplicity. Photorealistic 3D Views – Virtual Architect’s powerful 3D home design software lets you take a virtual tour and experience your newly designed kitchen in brilliant 3D!